The key to success in Limudei Kodesh is mastery of the Hebrew language. At ASHAR, immersion in Lashon Hakodesh begins in our Early Childhood Program, and continues through graduation. Our preschool students are taught Hebrew language through a special "Chalav U'Dvash" program, readying them for the eagerly anticipated Chagigat HaSiddur extravaganza at the beginning of first grade, during which students are presented with their Siddurim. 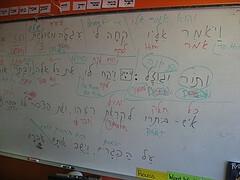 First and second grade morot and rebbeim utilize a modified, and enhanced, version of the acclaimed Tal Am curriculum. Shorashim and verb conjugation are stressed in all grades, and students are gradually exposed to formal klalei dikduk and several binyanim. Grade appropriate Hebrew literature, chiburrim and Hebrew homework in all Limudei Kodesh subjects, and word walls all serve to strengthen Hebrew language skills. Most importantly, teachers instruct and converse with students in Ivrit. Through constant and consistent whole-language immersion, formal language lessons come alive and are more naturally absorbed and appreciated. Beginning in fifth grade, students are tracked in Lashon according to level. A Hebrew language and kriah specialist works with those students who may initially require extra help, thereby allowing each student to maximize his or her potential. 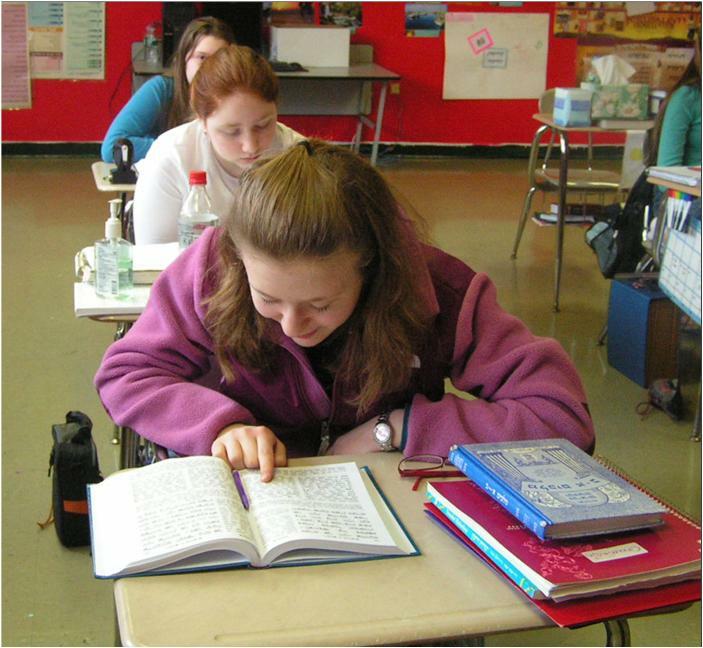 Most of our graduating students take the high school New York State Regents Hebrew exam at the end of eighth grade. The greater part of first grade is spent on studying shorashim, prefixes and suffixes of words commonly found in Chumash. Children spend much time on this in conjunction with other Lashon programs. K’tiva (writing) is also extensively practiced. At the beginning of second grade the students receive their Chumashim. They complete Sefer Bereishit by the end of fourth grade, much of Shemot in fifth grade, and Bamidbar in sixth grade. Rashi is introduced in third grade, and the skills of decoding and understanding Rashi are honed through the eighth grade. Our seventh grade Chumash curriculum focuses on Parshiyot Re’eh, Shoftim, Ki Teze, and Ki Tavo. Although only four Parshiyot are taught, they contain a bit more than 175 of the 613 (Taryag) Mitzvot. We teach these Parshiyot b’iyun (in depth) and we use the topics covered in them as a springboard to learning and understanding over 250 Mitzvot of the Torah. Using many sources from Gemara, Midrashim, and Meforshim, our students truly learn the geography of Chamisha Chumshei Torah during this year. A similar approach is used in eighth grade for Sefer Vayikra, after an intense review of many parshiyot in preparation for the Board of Jewish Education High School Entrance Exam (BJE’s) administered in mid-November. As an extension to the Chumash curriculum, the students in the upper grades enjoy a variety of unique experiences including hands-on kashering of chicken and hilchot cheilev (Re’eh). When the opportunity presents itself, we take our students to a farm where they experience the halachot of differentiation of kosher vs. non-kosher animals, dinei b’chor and dinei shechita, to name a few. The boys also have a safrut workshop where they learn hilchot tefillin, how to organize the parshiot therein, and how to sew the batim. There are also trips for different grades, including the Torah Museum of Boro Park, and the Children’s Museum, located on Eastern Parkway. Students begin studying Navi in fourth grade, beginning with Sefer Yehoshua, and followed by the books of of Shoftim, Shmuel, and Melachim respectively. By the end of eighth grade, an ASHAR student has completed Nevi'im Rishonim, and has acquired a knowledge base and skill sets that will serve as the foundation for future Tanach study at an advanced level. Through Navi, teachers strive to convey the dynamic nature of our rich history, and its' relevance to us- nevuah she'hutzracha l'dorot. The beginning of eighth grade is devoted to intensive review of Yehoshua, Shoftim, and Shmuel, in preparatioh for the B.J.E. High School Entrance Examination. All of Jewish life revolves around Halacha, whose primary basis is Torah She'baal Peh, our Oral Tradition, as redacted in the Talmud: Mishna and Gemara. Boys begin Mishna in fourth grade, generally studying Masechtot Berachot and Sukkah. Though rebbeim regularly test students, both orally and through written examinations, for retention, the greater emphasis is on comprehension, skill-building, and developing a love for "grown up" talmud Torah. Gemara study begins in fifth grade. 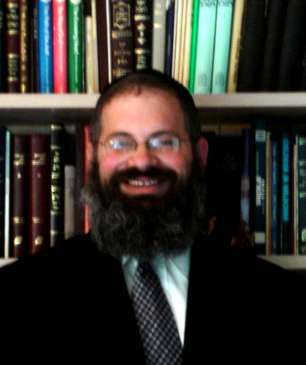 Generally, Eilu Metziot is studied in fifth grade, while sixth, seventh, and eighth grades follow a three-year cycle of Lulav HaGazul, Arvei Pesachim, and Makkot. Rebbeim strive to gradually introduce students to the finer points of shakla v'tarya- Talmudic discourse and rhetoric. Recognizing the inherent difficulties of new concepts, vocabulary, and structural complexities, our teachers patiently isolate the various stages of the Talmudic process, while simultaneously maintaining fidelity to the integrity of the composite sugya. A concerted effort is made, however, to ensure that rigorous skill-building not sap Gemara, and the requisite rebbe/talmid relationship, of its innate beauty, excitement, and "geshmak". Co-curricular grade appropriate Masmidim and Mishmar programs complement the Yeshiva's regular course of study. Girls' classes also begin formal Torah She'baal Peh (TSBP) study in fourth grade, studying Halachic topics from primary sources. Students are introduced to the Halachic process as articulated by the Rambam in his Introduction to Mishna, and gain an appreciation of the sequential development of Jewish law and practice. Talmudic texts serve as a springboard, for thoughtful, and sometimes provocative, class discussions with mechanchot, thus providing a basis for "Torat Chaim"- Torah for life. Like our boys, girls are expected to acquire basic textual and cognitive skills that will support a lifetime of continued growth in Torah study and Torah living. ASHAR's Halacha curriculum includes grade appropriate study of dinim as they relate to the Jewish calender and daily living. Laws are studied as separate units, but also often integrated into other subjects, such as Chumash and TSBP. Our goal is to convey an appreciation not only of the Halachic process, but the feasibility of living a full life uncompromisingly loyal to Torat Chaim. Whenever possible, primary classic texts- such as Kitzur Shulchan Aruch or Chaye Adam- are utilized. Teachers supplement texts with additional background information and provide complementary materials as needed. Before the Yamim Tovim, students study from specially prepared texts, based on the highly acclaimed workbooks of Rabbi Nachum Muschel. A lively school-wide chidon highlights the children's Yom Tov preparations. A popular element of our Halacha curriculum is a comprehensive Yediot Klaliyot program. Entering its' second year, students in grades 2-8 review a corpus of basic Jewish knowledge- information critical to educated Jews that is sometimes neglected during the regular course of study. Material is divided into six units, each studied over a five week period and prominently displayed on school bulletin boards. Teachers and administrators distribute raffle tickets to children able to answer relevant questions, and prizes are awarded at school-wide assemblies. Actual 5769-70 Yediot Klaliyot packets can be viewed below; this year's installment, "machzor bet", is the second in a multi-year sequential series that both reinforces previous knowledge and gradually increases the knowledge base. Yediot Klaliyot Curriculum: Grade 2, Grades 3-5, Grades 6-8. Jewish History Elements of Jewish History, including the Holocaust, are taught as part of our upper grades' general history curriculum.